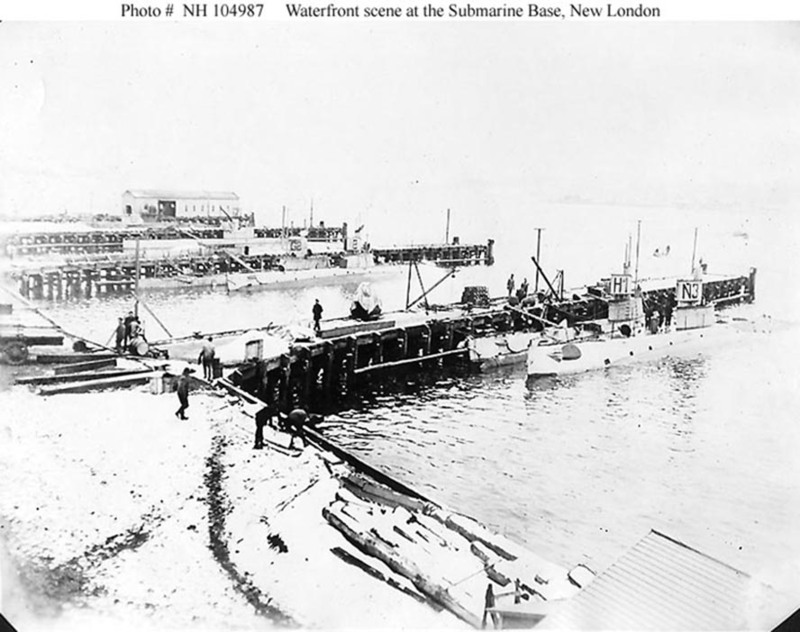 E Class Submarine: Laid down, as Sturgeon, 22 December 1909, at Fore River Shipbuilding Co., Quincy, MA. ; Launched, 16 June 1911; Renamed E-2, 17 November 1911; Commissioned USS E-2, 14 February 1912; Battery explosion on 15 January 1916 at New York Navy Yard, 4 dead, 10 wounded; Decommissioned, 13 March 1916, at New York Navy Yard New York, NY; Recommissioned, 25 March 1918; Re-designated SS-25, 17 July 1920; Decommissioned, and struck from the Naval Register, 20 October 1921, at the Philadelphia Navy Yard, Philadelphia, PA.; Final Disposition, sold for scrapping, 19 April 1922. Specifications: Displacement, Surfaced 287 t., Submerged 342 t.; Length 135' 3"; Beam 14' 7"; Draft 11' 8"; Speed, Surfaced 13.5 kts, Submerged 11.5 kts; Depth Limit 200'; Complement 1 Officer 19 Enlisted; Armament, four 18" torpedo tubes, four torpedoes; Propulsion, diesel electric, New London Ship & Engine Co., diesel engines, 700 hp, Fuel Capacity 8,486 gals., Electro Dynamic Co. electric motors, 600 hp, Battery Cells 120, twin propellers. 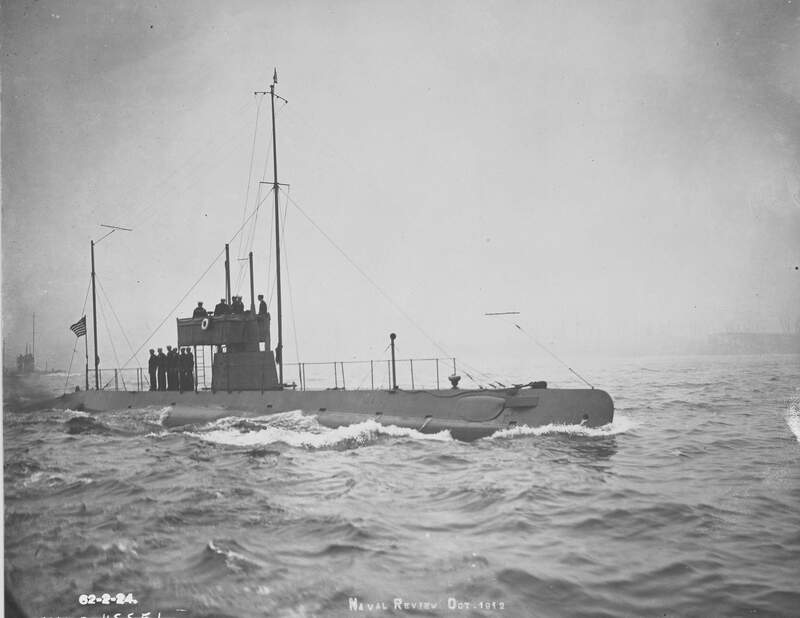 179k E-2 (SS-25), was in effect, a diesel powered D-boat incorporating the changes ordered in 1908. Drawing by Norman Friedman. Photo & text courtesy of U.S. Submarines Through 1945, An Illustrated Design History by Norman Friedman. Naval Institute Press. 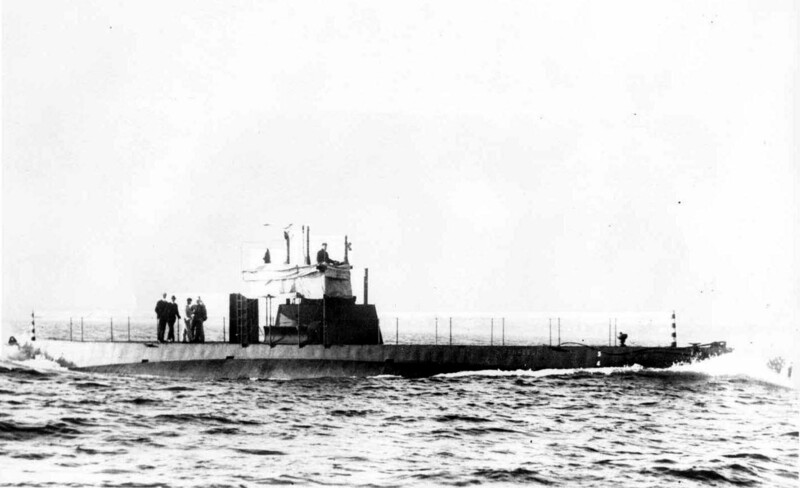 105k E-2 (SS-25) underway, probably during trials, circa late summer or fall 1911. USN photo courtesy of ussubvetsofwwii.org. Text courtesy of U.S. Naval Historical Center Photograph # NH 99186. THE E-1 (SS-24) & E-2 (SS-25), NOW AT THE NAVY YARD, WILL START FOR A TEST RUN TO NORFOLK TODAY. Master, the pet of the E-1, and Lady, the favorite of the E-2. Image and text provided by Library of Congress, Washington, DC. Photo from New-York Tribune. (New York [N.Y.]) 1866-1924, 05 March 1912, Image 5, via chroniclingamerica.loc.gov. 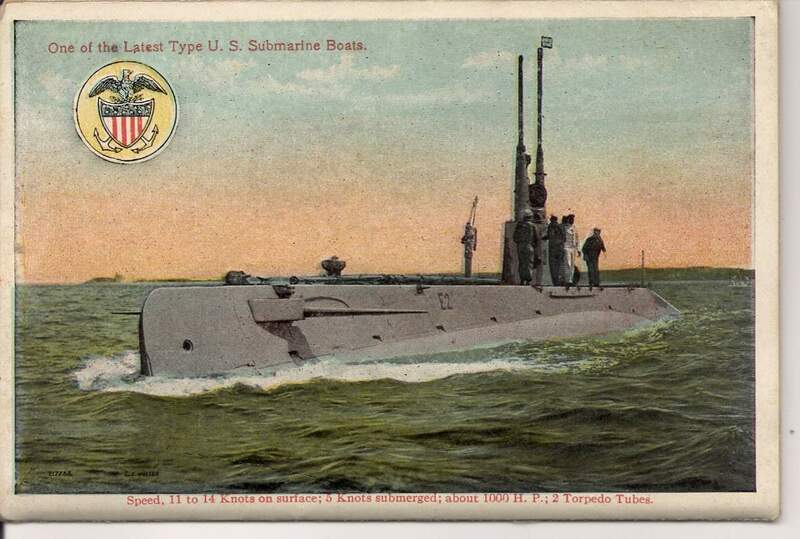 87k E-2 (SS-25), a 287-ton E-1 class (SS-24/25) coastal submarine built at Quincy, Massachusetts, as commissioned on 14 February 1912 under the command of Ensign Clarence Nelson Hinkamp. He is pictured here as a full Commander. Photo courtesy of the Library of Congress via Bill Gonyo. Text i.d. courtesy of Ric Hedman. 627k E-1 (SS-24) and E-2 (SS-25), Navy's Newest Submarines, Burn Crude Oil. Image and text provided by Ohio Historical Society, Columbus, OH. Photo from The Democratic Banner. (Mt. Vernon, Ohio) 1898-192?, 19 March 1912, Image 1, via chroniclingamerica.loc.gov. 649k E-1 (SS-24) underway, starboard side view, at the Naval Review at New York City, 4 October 1912. 228k The crews of E-1 (SS-24) & E-2 (SS-25) share some exciting moments while moored together dockside. Date is hard to say but most likely pre-WW I due to the chariot bridge structures not installed. USN photo courtesy of Scott Koen & ussnewyork.com. Photo i.d. courtesy of Ric Hedman. 62k A number of boats home-ported in Key West had squadron numbers in the "2" over some number sequence. 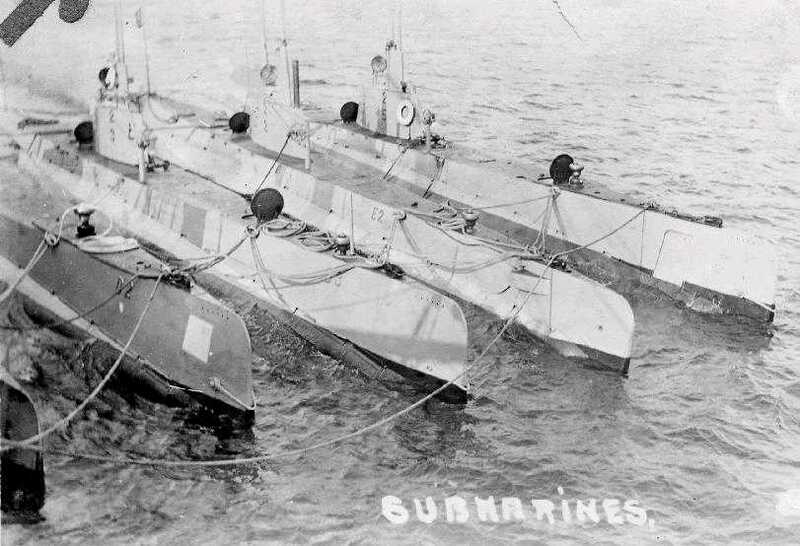 Identifiable boats are: (2nd from the left) D-2 (SS-18), (middle) D-3 (SS-19), (2nd from the right) E-2 (SS-25). Photo courtesy of The US Navy Submarine Force Museum via Ric Hedman. 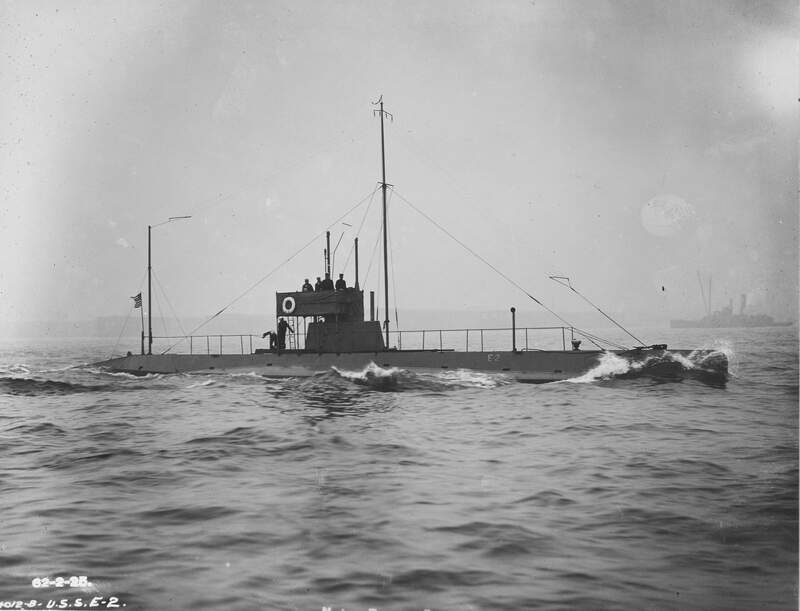 1.02k Fine screen halftone reproduction of a photograph of the E-2 (SS-25) underway prior to World War I. The same photo appears here as a post card. Official USN photo # NH 99185, from the collections of the Naval Historical Center, courtesy of Tommy Trampp. E-2 (SS-25), One of the Latest Types of Submarine. Image and text provided by Library of Congress, Washington, DC. Photo from New-York Tribune. (New York [N.Y.]) 1866-1924, 04 April 1915, Image 41, via chroniclingamerica.loc.gov. 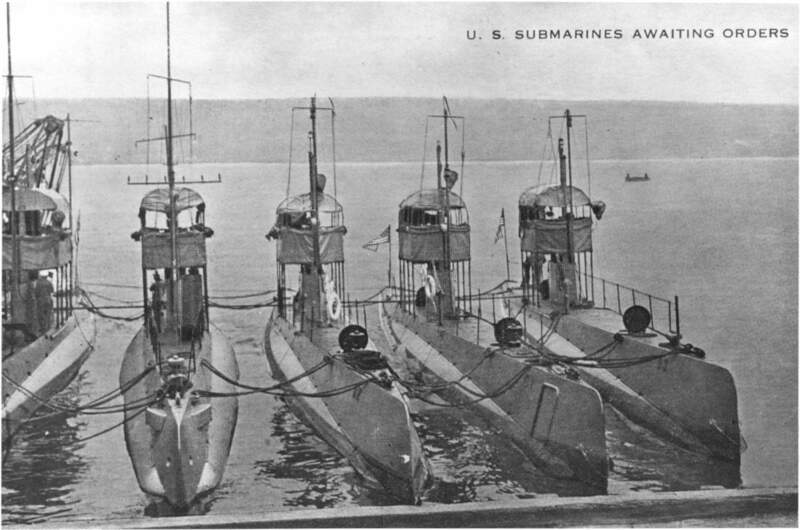 377k "U.S. Submarines awaiting Orders"
Halftone reproduction, printed on a postal card, of a photograph of five submarines nested together prior to World War I. The three "boats" at right are (from center to right): D-2 (SS-18); D-1 (SS-17); and D-3 (SS-19). The two at left are probably (in no particular order) E-1 (SS-24) and E-2 (SS-25). Photograph # NH 78926 from the U.S. Naval Historical Center, courtesy of Commander Donald J. Robinson, USN (Medical Service Corps), 1973. 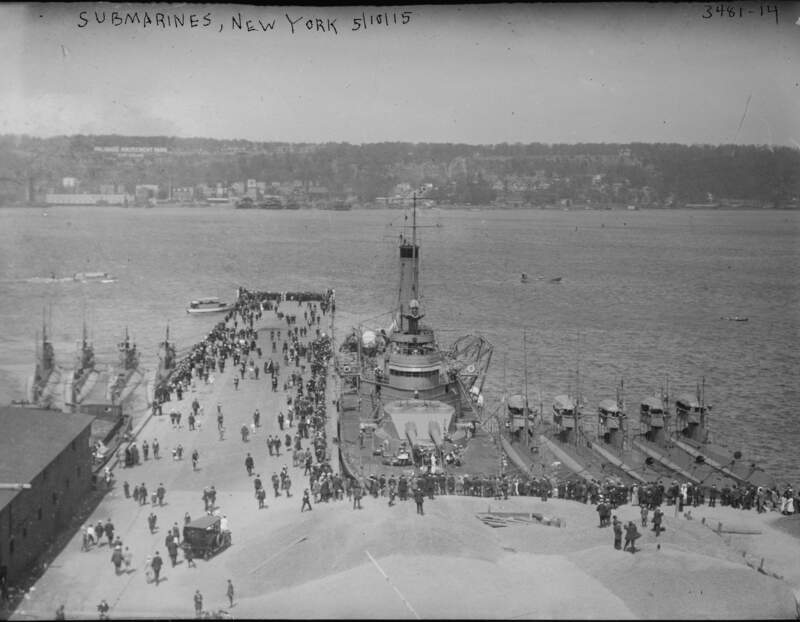 626k Photograph shows US submarines moored at the 135th street pier on the Upper West Side of New York City as part of the Presidential review of the Atlantic Fleet. The picture shows the Tonopah (M-8) in the center, with the submarines E-1 (SS-24), E-2 (SS-25), D-2 (SS-18), D-1 (SS-17) and D-3 (SS-19) lying from left to right alongside the dock at 135th street. Digital Source: Bain News Service. LOC photo # LC-B2-3481-14 / 19118v from lcweb2.loc.gov. 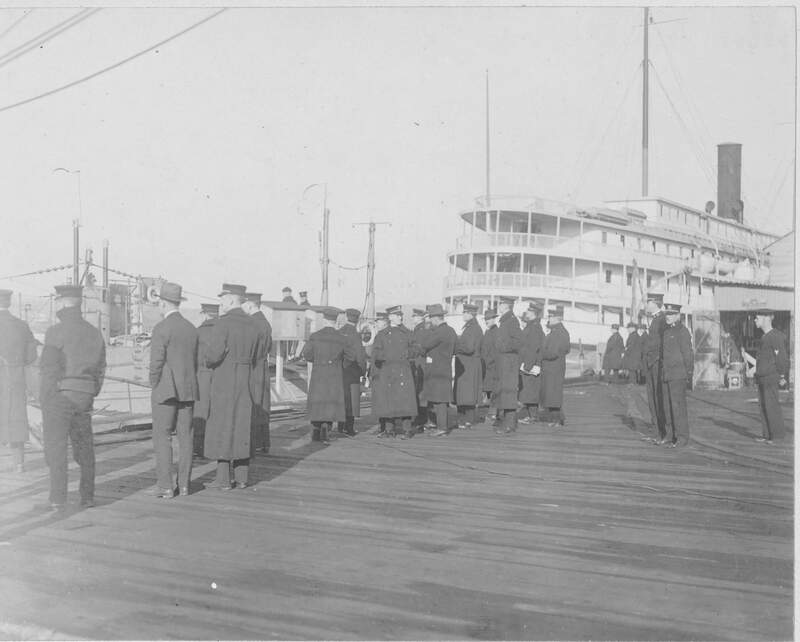 These vessels led the Atlantic fleet which arrived in New York for the big review by President Wilson. The picture shows the Tonopah (M-8) in the background, with the submarines E-1 (SS-24), E-2 (SS-25), D-2 (SS-18), D-1 (SS-17) and D-3 (SS-19) lying from left to right alongside the dock at 135th street. On recount of the activities of the submarines in the European War, these little under-the-water craft of the United States navy are coming in for a great deal of interest by the public. Image and text provided by Penn State University Libraries; University Park, PA.
Photo from Evening Public Ledger. (Philadelphia [Pa.]) 1914-1942, 08 May 1915, Night Extra, Image 18, via chroniclingamerica.loc.gov. Submarine G-2 (SS-27) laid up for repairs. Submarine commanders�(a) K. Robottem, D-2 (SS-18),(b) C. M. Cooke, E-2 (SS-25), (c) T.Withers, commander second division of submarines, (d) Yates Stirling, commander, Atlantic squadron of submarines)(e), R. S. Fay, D-3 (SS-19), (f)E. C. Metz, D-1 (SS-17). Image and text provided by State Historical Society of North Dakota. Photo from Grand Forks Daily Herald. (Grand Forks, N.D.) 1914-1916, 02 August 1915, Image 11, via chroniclingamerica.loc.gov. Henry Ford going aboard E-2 (SS-25) on inspection tour of United State undersea craft. Inventor Sees Undersea Craft for First time, Shakes Head Over Cost After Inspecting K-5 (SS-36) and E-2 at Navy Yard Docks. Image and text provided by Library of Congress, Washington, DC. Photo from New-York Tribune. (New York [N.Y.]) 1866-1924, 24 September 1915, Image 1, via chroniclingamerica.loc.gov. 678k FORD PREPARES FOR NATIONAL SERVICE BY STUDYING OUR NEWEST SUBMARINE. Following his plan of lending his inventive and mechanical ability to the strengthening of America's naval defenses, Henry Ford visited a submarine for the first time in his life in the New York navy yard. Escorted by navy yard officers and officers attached to the submarine flotilla of the Atlantic fleet, Mr. Ford was taking the newest and most up-to-date of American submersibles. 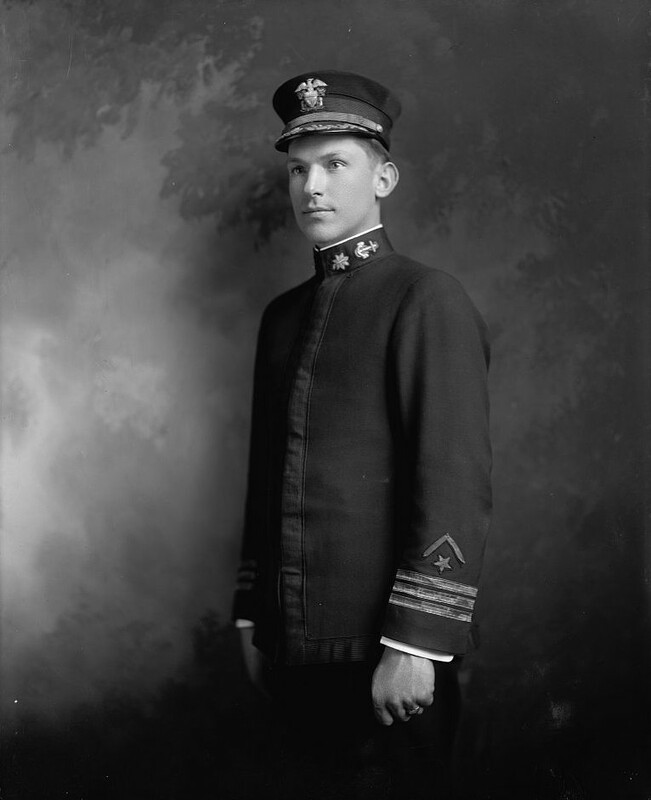 Mr.Ford went to the navy yard at the invitation of Secretary of the Navy Daniels, with whom he conferred in Washington on matters pertaining to the improvement of the navy, particularly the submarine arm of the service. At the yard Mr. Ford was met by Rear Admiral N. R. Usher, the commandant; Captain George E. Burd, the yard manager; Naval Constructor George H. Rock, Lieutenant Commander R. P. Craft, Lieutenant C. W. Nimitz of the submarine flotilla and Commander Earl P. Jessup of the navy yard staff. Image and text provided by Ohio Historical Society, Columbus, OH. Photo from The Democratic Banner. (Mt. Vernon, Ohio) 1898-192?, 28 September 1915, Image 1, via chroniclingamerica.loc.gov. In order to effect a diminutive two man submarine, powerful beyond anything yet conceived, Henry Ford, anxious to help out our national defense, visited one of our largest undersea craft in the New York navy yard. Image and text provided by Arizona State Library, Archives and Public Records; Phoenix, AZ. Photo from Tombstone Epitaph. (Tombstone, Ariz.) 1887-current, 17 October 1915, WEEKLY EDITION, Image 1, via chroniclingamerica.loc.gov. AFTER 55,000 experiments and five years of work, Thomas A. Edison believes he has perfected a battery that will revolutionize submarine construction and increase the efficiency of the undersea craft at least forty percent. The electrical wizard is shown at work on the battery, which is to be tested in the new American E-2 (SS-25). The battery has been completed some time, but the inventor has insisted on the most thorough going tests. The battery has been hammered, rattled, shaken,jerked and tossed about in a manner no over or undersea going craft could possibly duplicate. The battery is smaller, lighter and stronger than the ones now in use. Besides, it eliminates the dangers from chlorine and other dangerous gases. With it installed, a submarine can dive at an angle of sixty degrees, while a fifteen-degree dive now is attended with danger. If the new Edison storage battery is one-half the success the inventor claims for it, the United States should immediately leap to first rank in the construction of efficient and safe submarines. Image and text provided by Library of Congress, Washington, DC. Photo from The Washington Herald. (Washington, D.C.) 1906-1939, 17 October 1915, FEATURE SECTION, Image 28, via chroniclingamerica.loc.gov. 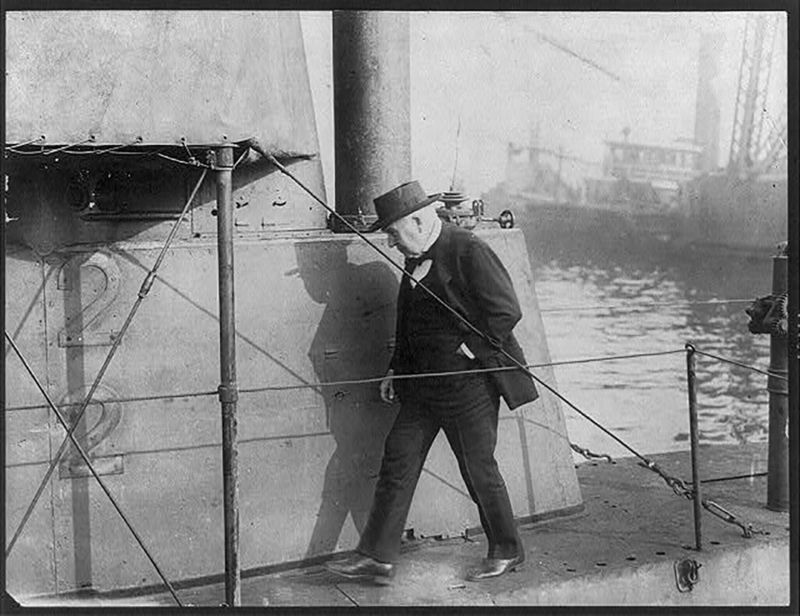 369k Thomas A. Edison, inspecting the E-2 (SS-25) submarine. Note that the # 22 appears on her conning tower. Photo # 3b11378t, LC-USZ62-63766, courtesy of memory.loc.gov. 306k Officers assuming command of submarines before leaving for practice. The one on the right is the E-2 (SS-25) (name on life ring) and the one on the left is what looks to be the L-3 (SS-42) or L-8 (SS-48) (see life ring). Photo i.d. courtesy of Ric Hedman. Thomas A. Edison, Chairman of the Naval Advisory Board, at the First Meeting of the Board in New York. Making an Inspection of E-2. Photo by American Press Association, courtesy of memory.loc.gov. Partial text from "The War of the Nations" (New York), 31 December 1919. Photo & text by New-York Tribune. (New York [N.Y.]) 1866-1924, 16 January 1916, Image 1, courtesy of chroniclingamerica.loc.gov. SCENE OF THE EXPLOSION AND THE WRECKED SUBMARINE. Image and text provided by The New York Public Library, Astor, Lenox and Tilden Foundation. Photo from The Sun. (New York [N.Y.]) 1833-1916, 16 January 1916, Image 1, via chroniclingamerica.loc.gov. 704k Submarine E-2 (SS-25) After Explosion; Her Commander and Some Victims Image and text provided by University of Oregon, Knight Library; Eugene, OR. Photo from The Evening Herald. (Klamath Falls, Or.) 1906-1942, 24 January 1916, Image 3, via chroniclingamerica.loc.gov. 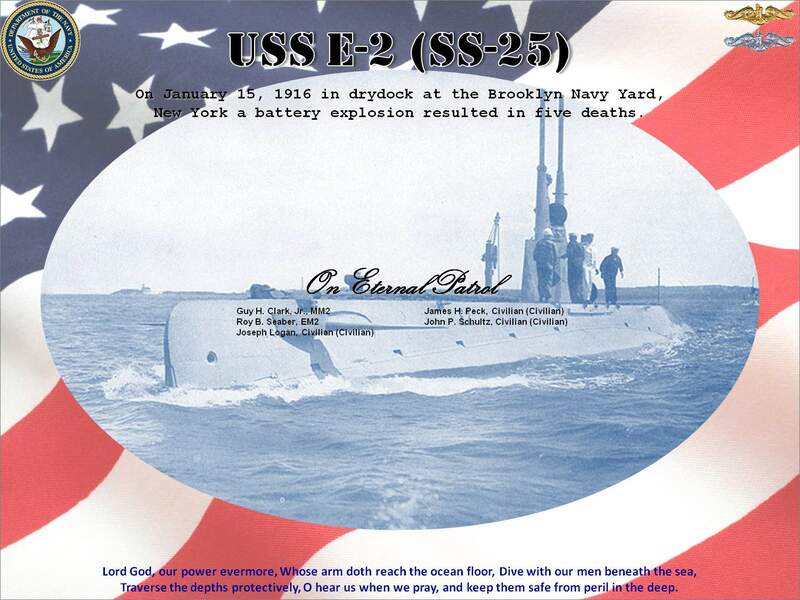 216k Commemorative photo honoring the memory of the crew of the E-2 (SS-25), 15 January 1916. Photo courtesy of Raymond Fritz. ET1(SS). 594k BLOWING UP OF E-2 (SS-25) DISCLOSES FOREIGNERS USE EDISON BATTERY. Naval and state authorities began searching investigations of the explosion on the United States submarine E-2 in the New York Navy Yard, in which explosion four men were killed and ten were injured. 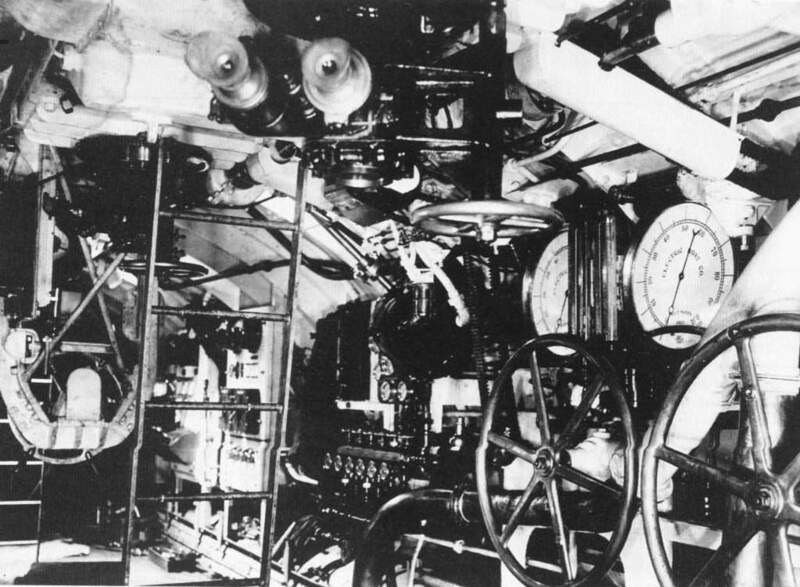 The E-2 was the only submarine in the navy equipped with Edison batteries, for which the chief merit claimed is that they do not give off chlorine gas. Also the E-2 had no gasoline on board, as her power is generated by a Diesel oil burning engine. There was no explosive powder aboard. If an accumulation of hydrogen caused the explosion, which was one explanation offered. It was gas which had accumulated between the top of the steel battery jars and the electrolyte. Thomas A. Edison's personal representative and chief engineer, Dr. Miller Resse Hutchison, defended the Edison battery and declared that the Edison submarine safety battery was in use in war by one power. It had been supposed that the United States had an option on the exclusive use of the device if the tests to which it was to be subjected proved satisfactory. The photographs show: Nos. 1 and 3, taking bodies from the E-2 after the explosion; No. 2. the E-2 on a recent practice run. Image and text provided by University of Utah, Marriott Library. Photo from The Logan Republican. (Logan, Utah) 1902-1924, 29 January 1916, Image 6, via chroniclingamerica.loc.gov. 625k Undated World War One pic of the submarine E-2 (SS-25) making a periscope observation at slow speed. White spot in front of periscope is a seaplane recognition mark. Images scanned from A History Of The Transport Service: Adventures And Experiences Of United States Transports And Cruisers In The World War, by Vice Admiral Albert Gleaves, USN, Pub. by George H Doran Company, New York. 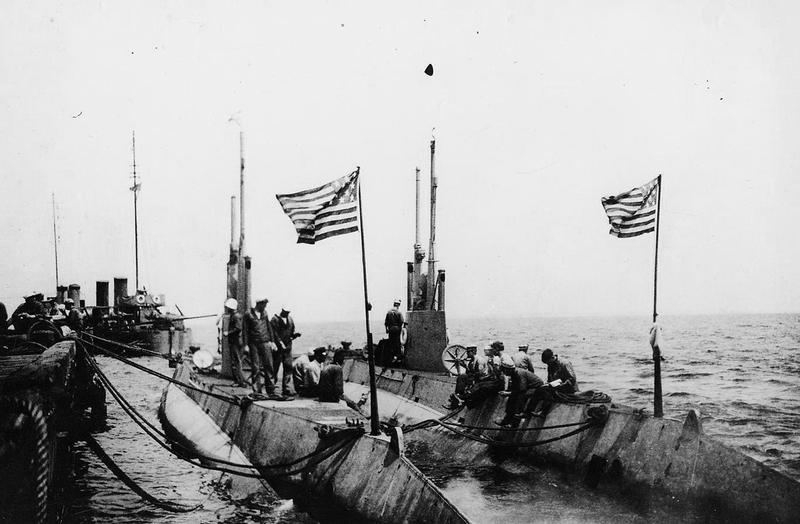 613k The schooner (decoy ship) Helvetia (SP-3096) accompanied by two U.S. Navy submarines (one of which is E-2 (SS-25)) while on an anti-submarine patrol in 1918. Images scanned from A History Of The Transport Service: Adventures And Experiences Of United States Transports And Cruisers In The World War, by Vice Admiral Albert Gleaves, USN, Pub. by George H Doran Company, New York. 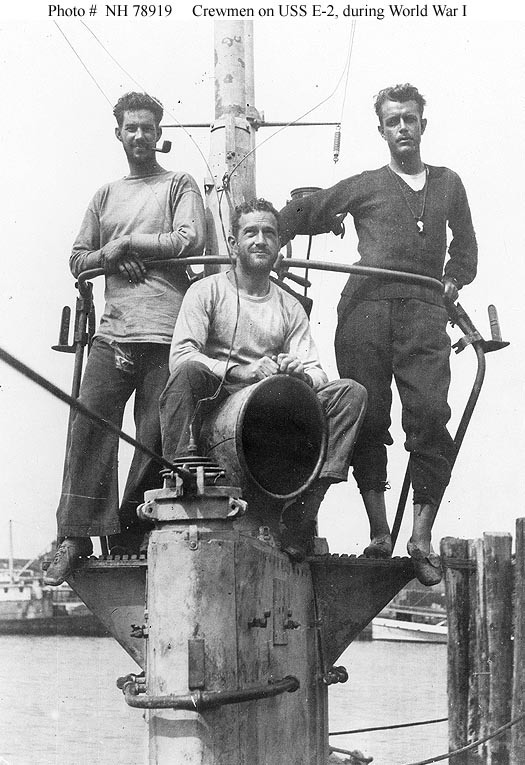 96k Crew-members atop the E-2's (SS-25) conning tower, after returning from a patrol during World War I. U.S. Naval Historical Center Photograph # NH 78919. Courtesy of the Submarine Force Library and Museum, Groton, Connecticut, 1972. 110k N-3 (SS-55) & N-7 (SS-59) are outboard and closest to the camera in this Winter 1918 photo at New London, CT. Other boats are H-1 (SS-28), G-2 (SS-27), & E-2 (SS-25). Photograph from the album of Lieutenant (Junior Grade) Edward D. Porges. Donated by his daughter, Gail Porges Guggenheim, 2007. U.S. Naval Historical Center Photograph. Photo #: NH 104987 via Robert Hurst. 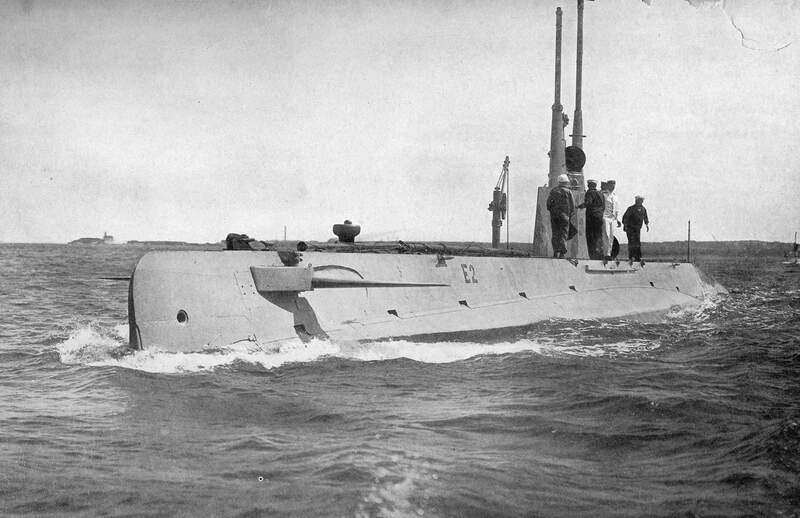 81k Helvetia (SP-3096) under sail, as seen from the submarine E-2 (SS-25), during an anti-submarine patrol in 1918. 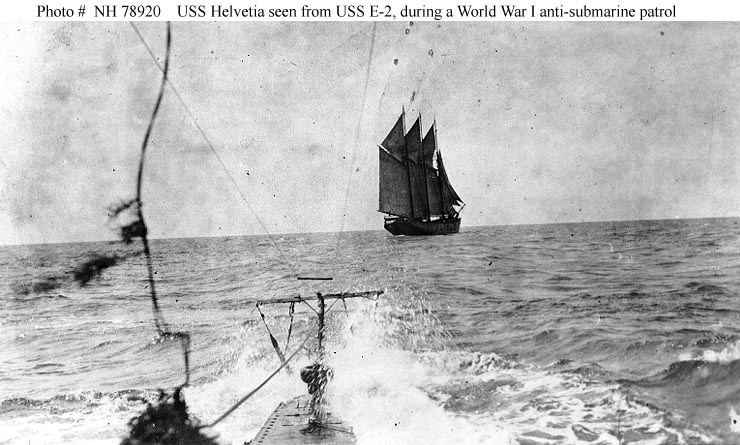 Helvetia, a former civilian schooner, was intended to serve as decoy ship to entice German submarines to surface and attack her with gunfire, hereupon the U.S. Navy submarine, following submerged, would torpedo the enemy U-Boat. U.S. Naval Historical Center Photograph # NH 78920. Courtesy of the Submarine Force Library and Museum, Groton, Connecticut, 1972. 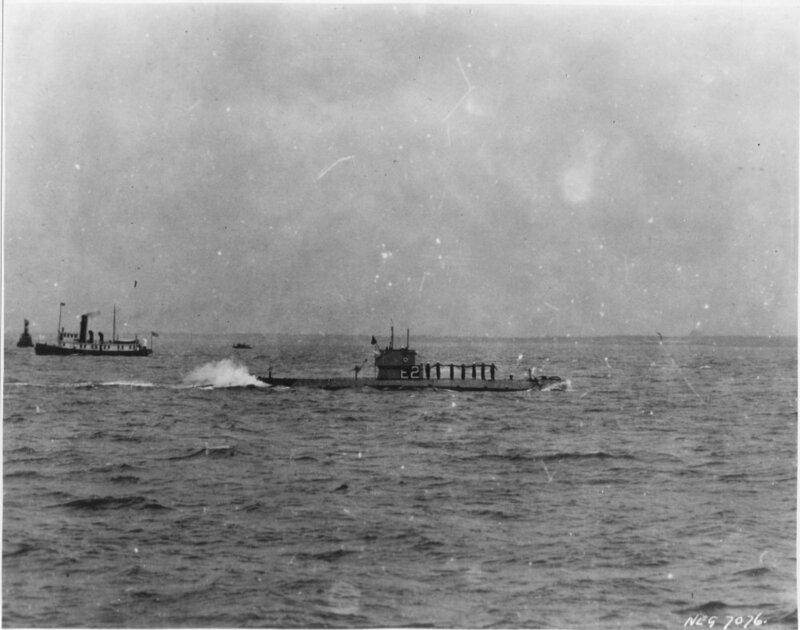 361k E-2 (SS-25), accompanied by a tug as she passes a buoy marker while entering or leaving a harbor, possibly after her recommissioning, 25 March 1918. USN photo from NARA # 19-N-7076, courtesy of Daniel Dunham. 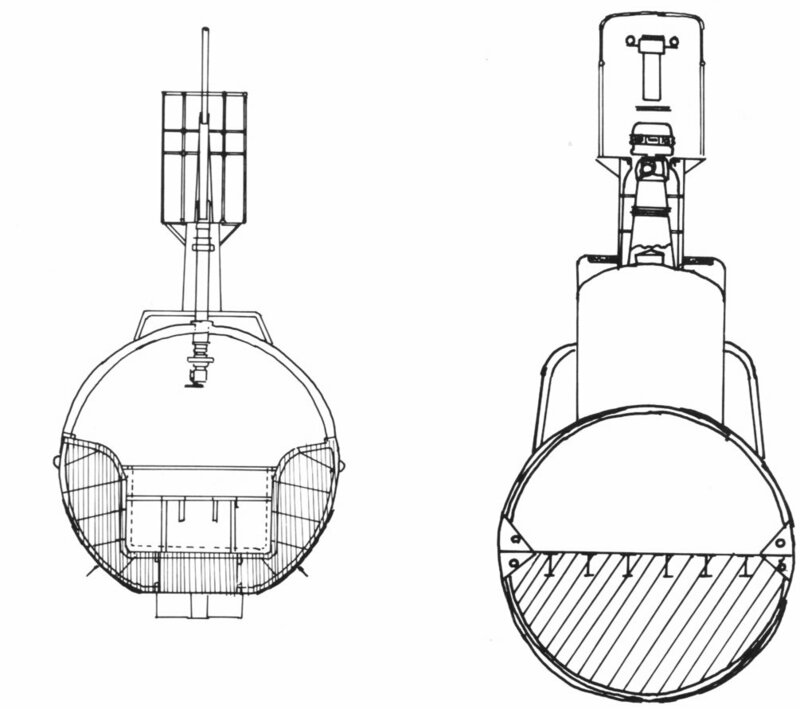 83k A mid-ship cross section of the E-2 (SS-25),(left) illustrates Holland's patented U-shaped tank, in this case surrounding the boat's safety (adjusting) tank. 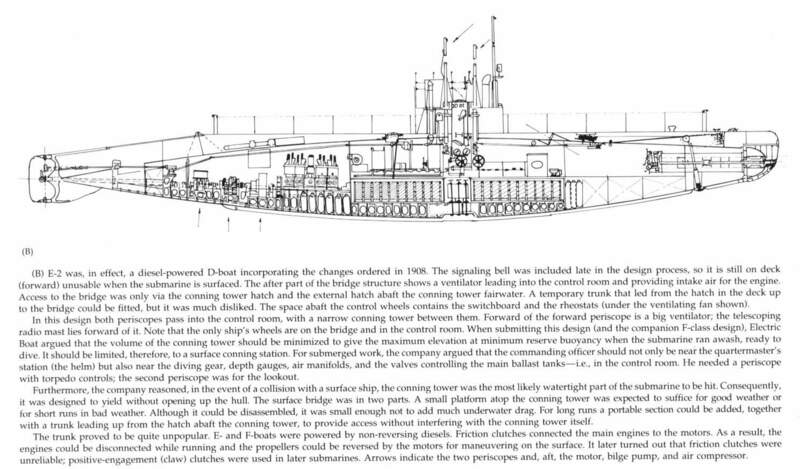 A similar cross section of Lake's G-1(SS-19½) is shown at right. Because Holland had patented the U-shaped ballast tank, Simon Lake had to use inefficient flat-topped tanks. For example, he had to place his batteries on top of his tanks (limiting overhead space), where Holland could surround batteries with tankage. In both drawings, shading indicates ballast water. Note that E-2's hull is not perfectly circular, it has a flat bottom where the pressure hull joins the duct keel. Photo & text courtesy of U.S. Submarines Through 1945, An Illustrated Design History by Norman Friedman. Naval Institute Press. 109k A view looking aft through the operating compartment of E-2 (SS-25) shows the dual eyepieces of her two periscopes, each with a hand-wheel nearby. The wheels controlling the planes, each with its own depth gauge, are to the right. Note the belt connecting the stern plane wheel to the control rod running along the overhead. In the background is the boat's wheel, in a yoke suspended from the overhead. The ladder abaft the foreground periscope leads up to the conning tower. Photo & text courtesy of U.S. Submarines Through 1945, An Illustrated Design History by Norman Friedman. Naval Institute Press. 1.30k A piece of the submarine E-2 (SS-25) being forced into the jaws of a huge pair of shears. Image and text provided by Library of Congress, Washington, DC. Photo & text by New-York Tribune. (New York [N.Y.]) 1866-1924, 29 July 1922, Image 16, courtesy of chroniclingamerica.loc.gov.